In Lean process improvement, one of the first steps you ever take is to walk the process. For manufacturing this means to go down to the floor where the product is made and walk with one piece from beginning to end. This provides the manufacturer insight into where there’s a great deal of waiting for product to come, leading to idle workers, where there’s a lot of inventory piled up – a bottle neck, if there’s a lot of rework – fixing defects like re-etching a person’s name on the back of an iPhone, and how the material flows around the floor. This works pretty well with doctor’s offices too. You can draw a map to all the different places the Dr. walks, the nurses walks, and where the patient walks. Any transportation in a Lean system is waste, so reducing that is important. Mapping value streams essentially take this to the next level. You map all the major steps that the material that goes into your product step through before and after you. This allows a manufacturer to see all the waste before and after them, enabling them to partner with their suppliers and customers to reduce waste and unnecessary processing. For example, many of us have worked retail. Some times when you do stocking you’ll find shirts that are in bags that are in a box. This is non-value add because it’s highly unlikely that the bag would protect the shirt from getting wet in the case of a flood. So, it’s a waste of plastic for the bag, putting the bags on the shirts, and removing the bags from the shirts are all waste. Which increases the cost of a shirt. 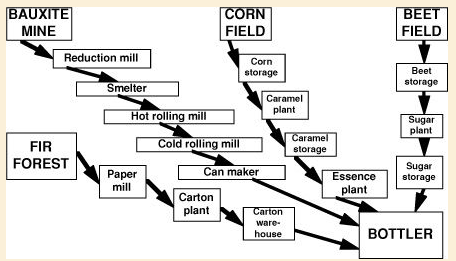 However, there’s a beginning and end of the value stream likely starting with cotton and ending with the final sale to the customer. In the case of a can of cola, it takes 319 days from the mining of bauxite to the consumption of the cola with only a total of 3 hours of actual processing of the material (Lean Thinking, Womack). Why such a long introduction? Well, the value stream for healthcare is completely different. The beginning is when you’re born and the end is when you die. Otherwise, every activity you partake in impacts your health and the eventual cost of any episode of care. An episode of care is what happens when you directly interact with a provider, hospital, or health insurer. Arguably, these are the exception to your normal behavior and take you out of your normal routine. Thinking about health in a value stream like this is non-intuitive for providers and insurers alike. As both have accounting practices and treatment plans that focus mainly on the episodes of care and minimize the remainder of the activities a member does. Thinking in this manner places more importance on preventative care, longer term plans for mental and physical rehabilitation, and care networks for long term diseases. This is a serious shift that is starting to occur in many insurance organizations, but aren’t very effective yet. The most effective portion of those three are the networks of patients that have a similar disease, such as Crohn’s Disease. I believe that looking at care in this fashion will help redesign the manner that care is designed as it will focus on different portions. As my friend Rachel pointed out, behavioral health issues are typically undervalued in the value stream of healthcare. However, with this model long term care issues should be given priorities as they impact the highest percentage of the value stream. It would also force insurers and providers to look at addressing care holistically and providing the best care in the best way when they can. Sending patients to clinics that can quickly treat conditions as cheap as possible. This entry was posted in Economics, Healthcare and tagged disease, health, health insurance, Healthcare, lean, Mental Health, process improvement. Bookmark the permalink. ← Healthcare: Why do we need medical policies?